“There are those who can, and there are those who will,” an old saying goes. James Paul David “Jim” Bunning was clearly one of the latter. He willed himself to become a great pitcher and then a successful politician through hard work and determination. Though he struggled for almost six seasons in the minor leagues, he was learning the craft of pitching. Ultimately, the lanky, 6-foot-3 freckle-faced kid from Kentucky would win 224 games, throw no-hitters in both leagues (the latter being a perfect game on Father's Day, June 21, 1964), get elected to the US Senate, and be voted into the National Baseball Hall of Fame by the Veterans Committee. Jim Bunning was born in Saint Elizabeth’s Hospital in Covington, Kentucky, on October 23, 1931, to Gladys (Best) Bunning and Louis Bunning of Newport, Kentucky, which is situated across the Ohio River from Cincinnati. Louis owned a ladder-manufacturing factory. The family was a tightly knit one. Gladys and Louis encouraged their children in whatever endeavor they chose. Most important of all were their Catholic religion and attaining a good education. Bunning had an older brother, Louis, and a younger brother, Robert. When Jim was 18 months old, the family moved to nearby Southgate, Kentucky. Jim attended St. Therese grammar school there. His first recollection of playing baseball was at a school picnic. Bunning recalled that he pitched all the time as a youngster because he had the only ball. His first outing in an organized league was in a knothole game. He pitched and played the outfield. With the knothole gang, Jim would go to the Cincinnati Reds games. The players he admired most were pitchers – Paul Derringer and Bucky Walters. Walters took top priority. One time, with his family at a restaurant, young Jim saw Bucky Walters sitting at a table. Jim was too bashful to go over and ask for an autograph. Older brother Louis got up the courage and went over to Walters’ table. The result was that Jim got his autograph and also a picture taken with Walters. The picture-taking was delayed a moment as Walters – mindful of his image – removed a bottle of beer from the table before allowing the photo to be taken. After finishing grade school, Jim went to St. Xavier High School in Cincinnati. As a freshman he played football and basketball, but not baseball. In his sophomore year he made the varsity football, basketball, and baseball teams. As a sophomore pitcher, he won six and lost two. As a junior, he won five and lost three. His senior year, with a poor team behind him, Bunning was 1-5. Graduating from high school in 1949, Bunning was admitted to Xavier University in Cincinnati. In May of his freshman year, Detroit Tigers scout Bruce Connatser told Jim’s father that the Tigers were interested in signing Jim. The parents had no objection to his playing professional baseball, but they wanted him to finish college. The Tigers agreed to let Jim finish the spring semester before reporting for baseball – meaning he would miss spring training for the next three years. The club also agreed that his first minor-league team would be Richmond, Indiana, of the Class D Indiana-Ohio League, less than an hour from home. The Tigers gave Bunning a $4,000 signing bonus and a $150-a-month salary. With the bonus, he bought an engagement ring for Mary Theis, his childhood sweetheart. Now that he was under contract to a professional baseball team, his basketball scholarship at Xavier was canceled, and his parents paid for the balance of his college education. Bunning got off to a great start at Richmond, winning his first five starts. “Boy, this is easy,” he must have thought. Then reality set in, and he lost his next seven and finished the year 7-8. He still had a lot to learn about pitching, but did well overall, allowing 120 hits in 123 innings, giving up 69 runs (44 earned), and compiling a 3.22 earned-run average. He struck out 83 and walked 68. After the season, Bunning returned to Xavier and increased his course load so he could graduate sooner. For his second season in the minors, the Tigers moved Bunning up to Davenport, Iowa, in the Class B Three-I League. He was 8-10 with a 2.88 ERA for the last-place team, giving up only 110 hits in 150 innings and striking out 103, but walking 105. That winter, in January 1952, Jim and Mary were married. As usual, Bunning missed spring training. After the spring semester ended, he reported to Williamsport, Pennsylvania, in the Class A Eastern League. Williamsport also finished in last place and Bunning was 5-9 (3.49 ERA). It was his worst season to date. Mary, pregnant with their first child, was back home. Discouraged after his dismal season, Bunning was determined to get back on track. He decided to forgo the overhand delivery the Tigers taught him in order to prevent him from falling off the mound at the end of his delivery, and enable him to field better. He reverted back to his three-quarter to side-arm delivery because he was comfortable with it. That year Bunning attended his first spring-training camp, in Lakeland, Florida, and was assigned to Triple-A Buffalo. The Bisons had a veteran staff and Bunning was not getting much work, so he was sent to Little Rock in the Double-A Southern Association. There he pitched 158 innings, but was only 5-12 with a 4.56 ERA. Bunning began to question whether he had the talent to get to the major leagues, but after talking it over with his wife, decided to keep trying. In 1954 Bunning was sent back to Little Rock, where he posted his first winning record, 13-11 in professional baseball. Manager Bill Norman had built up Bunning’s confidence by telling him that with his arm he should be a winning pitcher. Bunning realized that he did not have all the tools to make it to the big leagues – he needed a good breaking ball. He still relied on his fastball when he got behind in the count. His 1954 ERA was still high at 4.29, but knowing what he needed to do, he felt he was making progress. The Tigers took Bunning to spring training in 1955, then sent him to Buffalo. In July, with an 8-5 record, he was called up by the Tigers. Bunning made his first start on the 20th, lasting 7 2/3 innings in a 6-3 loss to Baltimore. He started seven more games and relieved in seven over the rest of the season. His record was 3-5 in 51 innings, with a 6.35 earned-run average. Jim, his wife, and their three children went to Mexico during the offseason so he could pitch in the Mexican winter league. He was determined to work on his breaking pitches. Manager Bobby Avila’s Mexico City Reds won the championship and Jim contributed a 9-4 record. He hoped to stick with the Tigers in 1956, but he had one option left, and the Tigers sent him to Triple-A Charleston. Bunning wrote later that he was unhappy with the way the Tigers handled sending players down. No one in the front office or the manager sat you down and talked to you. You found out when you went to your locker and your uniform wasn’t there. Bunning won 9 and lost 11 at Charleston and ended up fourth in the league in strikeouts while toiling for a second-division team. The Tigers recalled him in July. He started against the Washington Senators in his first game and lost, 4-1. He won his next start and finished the season with a 5-1 record and a 3.71 ERA. Twelve of his 15 appearances were out of the bullpen. Bunning decided he would give up the game if he didn’t make it this time. After the season ended, he pitched for the Marianao Tigers in Havana, Cuba. Returning to the Tigers for spring training in 1957, Bunning was in good spirits when manager Jack Tighe told him he would be a starter. Jim started the second game of the season, but after four straight singles in the first inning (two of them bloop hits), he was taken out of the game. He was relegated to the bullpen. Working in the pen helped Bunning become a much improved pitcher with a slider that he could consistently get over the plate. He became a pitcher, not just a thrower. He proved his mettle on May 16 when he finally got another start and pitched a five-hitter against the Boston Red Sox. The victory earned Bunning a place in the starting rotation. In his next start, against Baltimore, he pitched 13 innings until he left with the game tied, 1-1. Named to the American League All-Star team, Bunning was the starting pitcher for the American League, retired all nine batters he faced, and was credited with the win. He ended the season with a league-leading 20 victories (he lost 8 games), led the league in innings pitched, was second in strikeouts, third in earned-run average, and fourth in complete games. The only blemish was his 33 home runs allowed, the most off a pitcher in a season in Detroit history. What Bunning felt was important was that he won five games (in four starts) in September, proving to himself that he had the stamina to pitch well into the last month of the season. Bunning acquired a reputation for shrewdness in contract negotiations. Rick Ferrell, general manager of the Tigers from 1960 to 1962, said of the pitcher, “Bunning always thinks out his demands so carefully and considerately – as he sees it – that if it’s reasonable at all, we might as well sign him. Otherwise he’s prepared to discuss it forever. He’ll go over pitch by pitch of the entire season.”3 But despite his toughness in negotiations, Bunning was never a holdout, and he was the first Tiger to sign a contract for the 1958 season. After the 1957 season the Tigers, seeking some rest for Bunning’s arm, talked him out of playing in Cuba again by paying him the amount he would have earned there. When Detroit assembled again in Lakeland in the spring of 1958, he was now an established big leaguer and did not have to impress anyone to earn a spot on the club. His pitching in camp did not impress, but on Opening Day he outdueled Billy Pierce of the Chicago White Sox during a 4-3 Tigers victory. Winning on Opening Day was the last good thing to happen to Bunning for quite a while. The first month of the 1958 season was a nightmare for him. He was accused of throwing beanballs and was giving up too many homers. Topping off all those distractions was a rib injury he incurred in May. The homers were not as hurtful as the rib injury, as most of them were solo shots. The real problem with the homers was that they changed his demeanor on the mound. But Bunning eventually learned to live with the fact that since he threw strikes he was going to give up home runs. After the All-Star break, things turned around for Bunning. On July 20 he pitched a no-hitter against the Boston Red Sox. That was a confidence-booster and Bunning ended the season with a 14-12 mark and an ERA of 3.52. After the season he sold insurance. Again in 1959 Bunning had a mediocre spring training. But he finished the season with a 17-13 record, pitching 249 2/3 innings. During a relief appearance on August 8, Bunning became just the fifth AL pitcher to record three strikeouts in an inning on nine pitches. He led the league in strikeouts but set yet another Tigers record by surrendering 37 home runs. In 1960, despite an 11-14 record for a sixth-place team with a woeful offense, Bunning felt he pitched the best baseball of his career. He led the league with 201 strikeouts (the second year in a row he led with the same 201 Ks). He walked only 64 batters in 252 innings. The Tigers finished 26 games behind the first-place Yankees. Bunning quit his postseason insurance job, and worked out and rested. In 1961 the Tigers had a new manager, former catcher Bob Scheffing. Bunning and Scheffing had a confrontation early in the season. Bunning was unhappy when he was taken out of a close game because he felt that he could get on base as well as any of the Tigers’ pinch-hitters. Scheffing continued to pinch-hit for him in close games. This was a good year for the Tigers; they were either in the lead or close to the lead most of the season, until they lost 11 of 14 games in a September stretch and the Yankees won 13 in a row. That cost the Tigers the pennant, despite their achieving 101 victories. Bunning won 17 of those games, and lost 11. For Bunning, 1962 was also a good season as he won 19 and lost 10. Injuries to pitcher Frank Lary and outfielder Al Kaline damaged Detroit’s hopes. In 1963 the Tigers got off to a bad start, Scheffing was fired, and Chuck Dressen took the reins. Several times he held Bunning out of his normal rotation for an extra day or two, until Jim complained. Dressen took Bunning’s unhappiness to heart, and Jim won six of his last eight games. Dressen also wanted him to pitch with an overhand motion. Bunning refused, having already tried that without success. His outspokenness, being his teammates’ union representative, and the fact that he worked as a stockbroker in the offseason irked Tigers management. Bunning realized he might be traded. Bunning’s feeling turned out to be correct. During the winter meetings he was traded to the Phillies along with catcher Gus Triandos for outfielder Don Demeter and pitcher Jack Hamilton. Philadelphia manager Gene Mauch was elated; he felt it gave the Phillies a big boost toward contending in 1964. As he had in Detroit, Bunning assumed the role of player representative with the Phillies. He was one of the leaders in the search for a union chief. Almost immediately, he got the team to give the players free parking at the ballpark, and to allow players to bring their wives on some road trips. The 1964 Phillies got off to a 10-2 start and were in either first place or second most of the season. Bunning won his first two starts, beating the Mets 4-1 and the Chicago Cubs 10-0, striking out 20 batters in the two games. He was 9-2 at the All-Star break. With one out in the ninth, Bunning called catcher Gus Triandos to the mound. He asked Triandos if he could tell him a joke to relax him. Triandos looked at Jim as if he were crazy, laughed, and went back behind the plate. Pinch-hitter George Altman slammed a long foul into the right-field seats. Then Bunning struck him out. The last batter was pinch-hitter John Stephenson and Bunning struck him out on a curve. Jim pounded his glove and his teammates rushed out to greet him. It was the fifth perfect game in major-league history, and the first in the regular season since Charlie Robertson of the Chicago White Sox hurled one on April 30, 1922. It was the first in the NL since 1880. On September 20 the Phillies had a 6½-game lead with 12 games left to play. Cincinnati came to town and Chico Ruiz did the Phils in, 1-0, with a two-out steal of home. That started an epic collapse in which the Phillies lost ten games in a row. Three of the losses were charged to Bunning. The scores were 5-3 (Bunning gave up three runs in six innings), 14-8 (he surrendered seven runs in three innings, and 8-5 (he yielded six runs, five earned, in 3 1/3 innings). With two games remaining, Philadelphia still had a chance to tie for the flag and defeated the Reds twice, while the Mets surprisingly won twice against the Cardinals. But St. Louis defeated last-place New York on the final day of the season and won the pennant by one game over the Reds and the Phillies. For weeks after the dismal September, Bunning felt sick and despondent. Philadelphia Evening Bulletin columnist Sandy Grady didn’t help, asking Bunning if he felt like putting on a false beard, wearing dark glasses, and pulling all the shades down in the house, à la Floyd Patterson when he lost the heavyweight title to Ingemar Johansson in 1959. After a few weeks the agony started to subside and Jim snapped out of his misery. Many critics had put the blame on Mauch, saying he pitched Bunning and Chris Short too much in the last weeks of the season without proper rest. Bunning would have none of that; he blamed neither Mauch nor any one player for the lost pennant. He put the blame on the team as a whole, including himself. Bunning spent three more seasons with the Phillies. Still pitching fine baseball, he was 19-9 in 1965 with an ERA of 2.60; 19-14 in 1966 (2.41 ERA, with a career-high 314 innings pitched); and 17-15 in 1967 (2.29 ERA, while leading the NL in innings pitched and strikeouts). During the 1966 and 1967 seasons, he led the National League in games started and shutouts. In December 1967, Bunning was 36 years old, and the Phillies had just finished fifth in the ten-team National League. In a rebuilding mode, they traded Bunning to Pittsburgh for four players, including pitcher Woody Fryman. Bunning had an offyear for the sixth-place Pirates, finishing 4-14 with an ERA of 3.88. In August 1969 Bunning was 10-9 with the Pirates when, on August 15, he was sent to the Los Angeles Dodgers for two players and cash. He was 3-1 for the Dodgers and was released after the season. Bunning signed with the Phillies, by now wallowing in mediocrity. He was 10-15 in 1970 and 5-12 in 1971, after which, nearing the age of 40, he retired. Bunning became a manager in the Phillies farm system, starting at Reading in 1972, and moving on to Eugene, Toledo, and Oklahoma City. The Phillies dropped Bunning after the 1976 season. It dawned on them that they would have to contend with Bunning’s brutal honesty. He felt he’d been given false hope regarding the big-league manager’s slot and that farm director Dallas Green betrayed him. The two men had become close friends over the years. Their friendship abruptly ended. Before Bunning finished with the Phillies, he had agreed to manage the Escogido Leones in the Dominican Winter League. After that, Bunning tried to become a part-owner of the Houston Astros. When this failed, he returned home to Fort Thomas, Kentucky, and the brokerage business. He began representing some of his former players as their agent. By 1977 he had 30 players as clients. That year he was elected to the Fort Thomas City Council. In 1979 Bunning was elected to the Kentucky State Senate, and in 1983 he obliged the state Republican Party when they had difficulty finding a candidate and ran unsuccessfully for governor. In 1986 Bunning was elected to the US House of Representatives, and in 1998 he was elected to the US Senate. Meanwhile, in 1996 Bunning was elected to the Hall of Fame by the Veterans Committee. And in 2001 the Phillies retired his number 14. During his re-election campaign in 2004, Bunning exhibited odd behavior. He said of his opponent, Frank Daniel Mongiardo, a second-generation Italian, that he “looked like one of Saddam Hussein’s sons.”7 Then he accused members of Mongiardo’s staff of assaulting his wife. Bunning was rescued by some damage control from the Republican Party and won the election by just 2 percentage points, while President George W. Bush carried Kentucky by 20 points. By 2009 Bunning had lost the support of the powerful Kentucky Senator Mitch McConnell, effectively ending his political career. In March he apologized for a morbid remark he had made, saying he believed Supreme Court Judge Ruth Bader Ginsberg, “could die within a year from pancreatic cancer.”8 On July 27, 2009, Bunning said that “running for office is not just about the issues,” and “over the past year some Republican Party leaders in the Senate have done everything to dry up my fundraising.”9 He concluded by saying that he would not seek re-election in 2010. Bunning’s long tenure in the minor leagues and his election to the Hall of Fame in 1996 are testaments to his toughness and hard work. His political career may be remembered best for its brusque statements. His perfect game in June 1964 will always be remembered. Jim and Mary Bunning were married for more than 60 years. They had nine children, 35 grandchildren, and seven great-grandchildren. 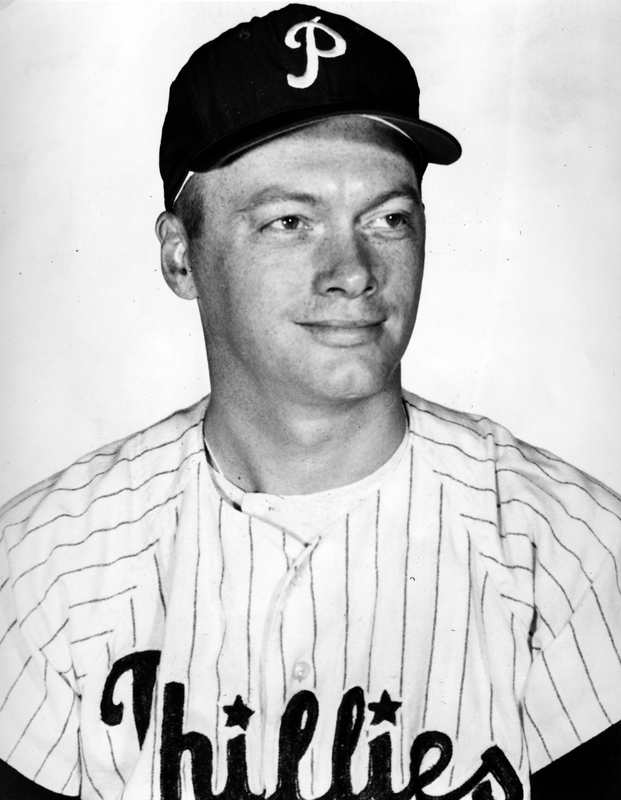 Jim Bunning died at age 85 on May 26, 2017. An earlier version of this biography is included in the book "The Year of the Blue Snow: The 1964 Philadelphia Phillies" (SABR, 2013), edited by Mel Marmer and Bill Nowlin. Bunning, James and Ralph Bernstein, The Story of Jim Bunning (Philadelphia: J.B. Lippincott, 1965). Clayton, Skip and Jeff Moeller, 50 Phabulous Phillies (Champaign, Illinois: Sports Publishing Inc., 2000). Dolson, Frank, Jim Bunning, Baseball and Beyond (Philadelphia: Temple University Press, 1998). James, Bill, The New Bill James Historical Abstract (New York: The Free Press, 2001). Light, Jonathan Fraser, The Cultural Encyclopedia of Baseball (Jefferson, North Carolina: McFarland and Company, 1997). Roberts, Robin and Paul C. Rogers, III. My Life in Baseball (Chicago: Triumph Books, 2003). Crowley, Patrick, “Bunning Gunning for Greenspan,” Kentucky Enquirer, February 7, 2001. Merchant, Larry, “Jim Bunning’s New Life,” Sport, November 1964. Louisville Courier-Journal, February 23, 2009. Time, April 14, 2006, July 29, 2009. Washington Post, July 27, 2009. USA Today, April 1, 2004. 1 Patrick Crowley, “Bunning Gunning for Greenspan,” Kentucky Enquirer, February 7, 2001. Accessed at http://enquirer.com/editions/2001/02/07/loc_crowley_bunning.html. 2 The author was unable to locate a printed account of this reasonably widely-told story. 3 The author was also unable to provide documentation for Ferrell’s quotation. 4 Larry Merchant, “Jim Bunning’s New Life,” Sport, November 1964. 5 Frank Dolson, Jim Bunning, Baseball and Beyond (Philadelphia: Temple University Press, 1998), 62. 6 Dolson, Jim Bunning, 6. 7 USA Today, April 1, 2004. 8 Louisville Courier-Journal, February 23, 2009. 9 Time, July 29, 2009; Washington Post, July 27, 2009.